This past week, the LAMB's Director's Chair spotlight was on John Landis, the director of such beloved '80s comedies as The Blues Brothers, Trading Places, Spies Like Us, and Coming to America. 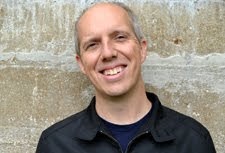 While he's worked sparingly in the past 10 years, Landis was once a trusted filmmaker with major box-office potential. After gaining a surprise hit with The Kentucky Fried Movie in 1977, he scored an even greater success with his third movie Animal House the following year. Despite its huge popularity and frequent references in pop culture, I've managed to go my entire life without seeing this movie. This gap was closed last week when I sat down and watched the raucous comedy. Let's get to the questions and find out if I'm ready to join the Delta House fraternity. Larry Kroger (Tom Hulce) and Stephen Furst (Kent Dorfman) are freshmen at Faber College looking to pledge a fraternity. It's 1962, and being an "independent" isn't a real option. After getting a cold reception at the straight-arrow Omega House, they join the Delta House. This much-different fraternity is full of mischief and a black mark for Dean Wormer (John Vernon). He's determined to get the Delta guys kicked off campus, but they won't go out without a fight. Their leaders Otter (Tim Matheson) and Boone (Peter Riegert) cause all types of trouble while trying to battle the Dean. Their brave accomplice is the ridiculous John "Bluto" Blutarsky (John Belushi), who has pretty much no limit to his antics. Their chances of survival are grim, but the Delta guys won't go out without one last great act. In a strange way, the popularity of Animal House turned me off from seeing it. The toga party clips still appear frequently in all types of random places. I still remember seeing the same footage at local hockey games every time the home team scored a goal. I'd also grown tired of hearing about the greatness of John Belushi. This movie and its characters occupied such a pedestal that it was bound to disappoint. Also, watching a movie that focused on a fraternity didn't seem interesting. I have a strong internal resistance to fraternities that was only strengthened during my college years at Mizzou. Even though the Delta House is far from the typical example, it still didn't seem exciting. My logic was obviously faulty since the preppy guys are the villains, but it's much easier to see that after watching the movie. Once again, I've chosen a period piece for this marathon, so this question is trickier. The story was based on the experiences of writers Chris Miller, Harold Ramis, and Douglas Kenney at their college fraternities, but it doesn't feel tied to a specific time period. 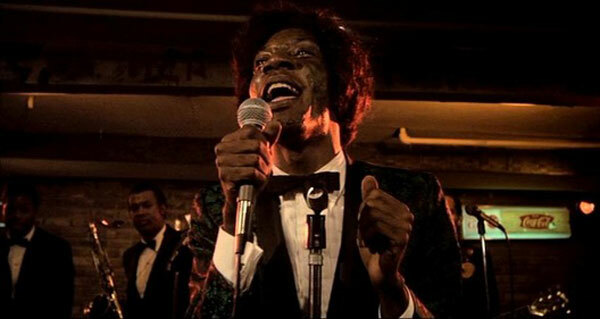 Music like the Isley Brothers' "Shout" (performed in the movie by Otis Day and the Knights) doesn't scream 1962. The clothes do connect to the early '60s, even for the less rigid Delta House. Recent films like Old School and American Pie owe a lot to this movie, which makes it seem modern despite being set 50 years ago. Their gross-out humor and wild party atmosphere connect back to this movie (and similar '80s hits) and don't feel much more progressive. Not really. Most of the characters are one-note figures without much depth. It's just not that type of movie. There are a few notable exceptions, and those instances relate more to the talents of the actors. The prime example is John Belushi, who's a revelation even after hearing all the hype about this role. Bluto lives in his own world apart from the movie and seems mostly detached from the main story. He utters few lines until his big speech but is always the most entertaining guy on the screen. The highlight is his run through the cafeteria line, which Belushi underplays perfectly despite the ridiculous actions as his character piles up his tray. The other strong example is Karen Allen as Katy, Boone's girlfriend. She has limited screen time and spends much of it pining for her teacher Dave Jennings (Donald Sutherland), but there seems to be more lurking beneath the surface. The other women in the cast are mostly thin characters cast to appear naked. This is obviously the norm in this type of movie, but it's still especially nasty towards the women. The obvious choice here is the toga party, which stands apart from the rest of the movie with all sorts of goofy antics. 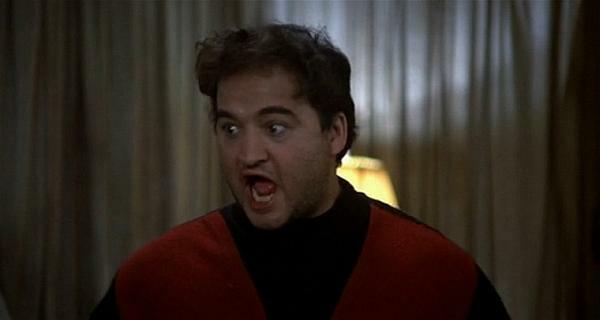 I also enjoyed Bluto's final rousing speech, which is way over-the-top but sold by Belushi's delivery. I was relieved that the hazing scenes weren't too frequent, as those could have gotten old quickly. The contrast between the nonchalant entry of the Delta guys with the strange Omega initiation rituals was well-done. Another odd sequence shows the evil and good sides of Larry's brain arguing over whether he should take advantage of a passed-out girl. It's a strange moment and comes out of left field for the fairly straightforward movie. The final parade sequence is also memorable as the entire town descends into chaos. My favorite moment involves the marching band, who mindlessly go down the wrong road and then try to keep playing while trapped in an alley. The destruction and everyone's reactions are ridiculous, but they fit within this movie's world. Animal House is a fun movie with some enjoyable scenes, but a lot of it is forgettable. I can see why it's maintained such great popularity over the years. The mayhem and general silliness of the entire production is hard to deny. Landis knows how to direct comedy and never wastes too much time on a single gag. I don't have any serious issues with the movie; it just didn't make a huge impression. I'm glad to know the context behind the big scenes ("Food fight!") that are still referenced today. 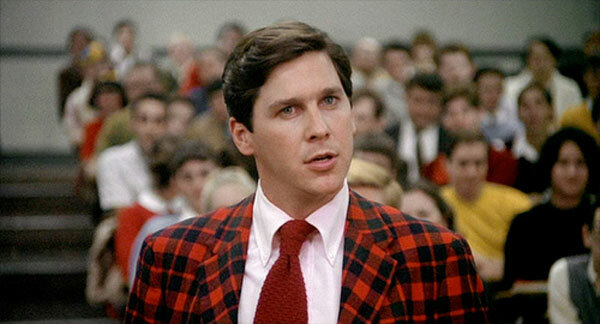 It's also good to see early performances from recognizable faces like Tim Matheson, Bruce McGill, and Kevin Bacon. My overall feelings are positive, though it's not a movie I'd revisit again in the near future. Animal House is good fun. This series is great Dan. Thanks Sam! It's been a lot of fun so far. I saw Animal House a lot when I was a kid, so I think I'll always like it. It's hard for me to be objective about this movie, because it's more of a nostalgia flick for me (well, I mean nostalgia for my childhood). Dave, you raise a good point about movies like Animal House. Viewing it now for the first time, it's hard for me to really "review" it because there's so much nostalgia to it. That's not a bad thing; it's just interesting when looking at some of these beloved movies. Thanks! "Was it over when the Germans bombed Pearl Harbor?!" Like you said, some good laughs but not a top echelon movie. Love that quote, Chip. Belushi's speech is one of the highlights. Thanks. Loving this series! God I haven't seen Animal House in years, may have to revisit it now. Thanks Alex! It's been fun to check out some well-known movies that are on the lighter side of things. I think this is another film that needs to be seen at the correct time of life. See this as a 20-year-old, and it becomes a favorite. See it when you're settled with a career and kids, and its popularity is a little more head-scratching. Steve, I think you hit the nail on the head. There were moments that I enjoyed a lot, but it's not going to have the same effect for me now than it would years earlier. Still, it was cool to see it for the first time. Sorry, have to disagree with the negative comments. I was a Freshman and pledged a frat in 1978. As part of our initiation the entire pledge class went to see the movie. And, as you can imagine, we lived out the movie for the next 6 months. Maybe I have such a love for this movie because of that tie-in. I have seen it at least 100 times and pretty much have the whole movie memorized. I can still whip out lines as comebacks to responses today. Both my son and daughter think it is hilarious and it is the favorite of my father, who was himself a member of SAE at Purdue in the 50's. An all-time classic that will never get old. People will still be cracking up to this 50 years from now. Oh, and I still have a huge crush on Karen Allen! Thanks for the comment. This is definitely a case where watching it now makes the difference. I went to college in the late '90s and wasn't in a fraternity, so my experience was a lot different. I still think Animal House is a fun movie and can't argue with anyone who loves it. I just didn't have as strong a reaction to it.